Bill McRaven's last day as chancellor of the University of Texas System is May 31. He spoke to The Texas Tribune in his last weeks about his time at the system, his aspirations for the future and higher education broadly. 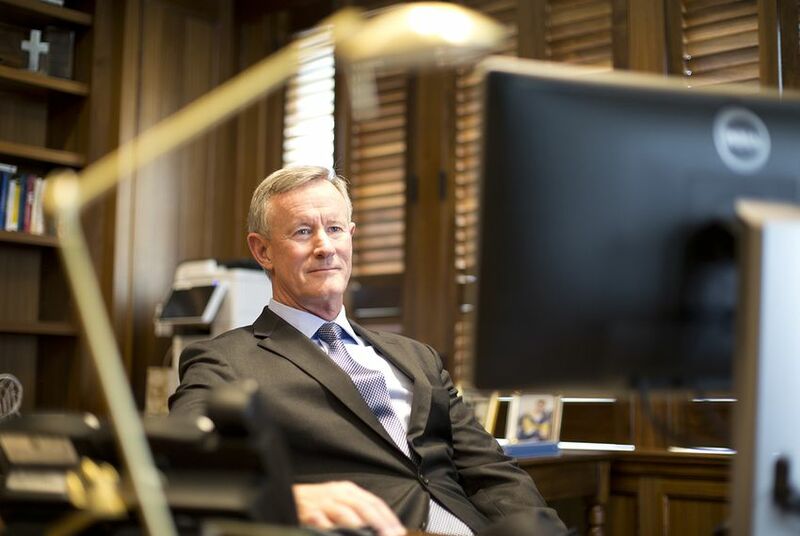 Bill McRaven’s last day as chancellor of the University of Texas System is Thursday. He helmed the 14-institution system for three and a half years, during which time he laid out an ambitious roadmap — structured around nine “Quantum Leaps” — to thrust Texas’ premier public university system to greater heights. McRaven told The Texas Tribune last week that “it’s not for me to determine my legacy; that's going to be for other people to determine.” But he said he’d largely accomplished what he’d hoped to as the system’s chancellor. He cited the system’s efforts to help students do better in college — in part by offering more advisors, and by forging partnerships between UT campuses and high schools. He said the system, during his time there, strove to address diversity and gender-pay issues by methodically interviewing underrepresented candidates for job openings and trying to close pay gaps. He spearheaded a large-scale initiative to study and prevent sexual harassment and misconduct on campus that was unique nationwide in its depth. And he noted the various programs and collaborations UT institutions have formed around the issues of national security, medical research and clinical care. McRaven wasn’t immune to criticism. One of the nine Quantum Leaps he’d outlined, the purchase of land in Houston for a collaborative center, drew the ire of lawmakers because they hadn’t been given advance notice of the deal and thought it was too expensive. (The land, purchased for $215 million, was later considered for a data science institute but is now being sold.) The system's scope and size, which also drew flak, is currently being evaluated by a task force of regents. 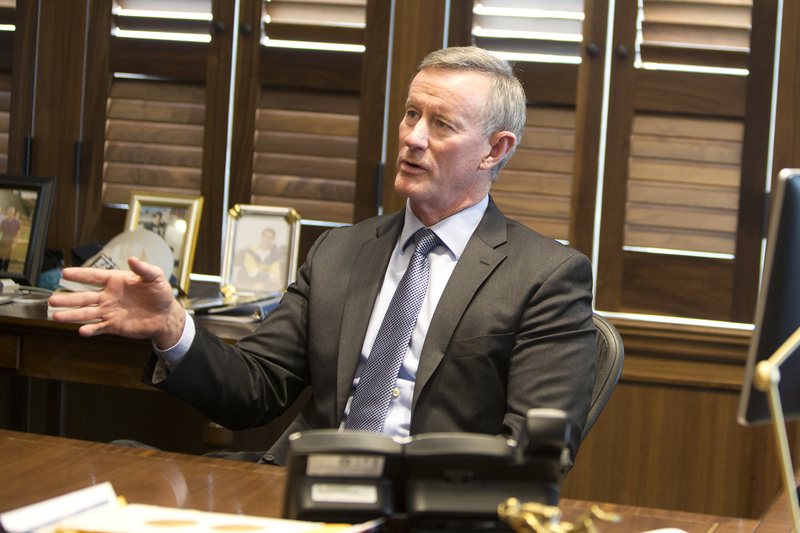 Before joining the UT system, McRaven spent 37 years in the military, where he led the U.S. Special Operations Command and gained national prominence for his role in masterminding the 2011 raid that killed Osama Bin Laden. He announced his intention to step down from the chancellor position in December, citing health concerns as a reason. McRaven suffers from non-life-threatening chronic lymphocytic leukemia and was briefly hospitalized a few weeks before he announced his planned departure. In a 30-minute interview last week, McRaven told the Tribune that his focus after leaving the system’s Austin headquarters this Thursday will be to get his health “back where it needs to be.” He said he expects to spend the next half year speaking and writing, then is slated to teach a course at UT-Austin’s Lyndon B. Johnson School of Public Affairs in the spring. He said it will likely be a seminar in the area of national security but that he will audit classes in the fall to make sure his offering is not redundant. TT: You've said in different interviews that you took the job of chancellor because you couldn't think of anything you'd rather do than be in a position to change the lives of the young men and women of Texas. But it seems like a huge part of your job has been managerial – which is in line with being CEO of the system. Was the job of chancellor what you thought it would be, and what you wanted it to be, when you took the job? McRaven: I would say I think it was more than I hoped it would be. I don't think, when I took the job, that I fully understood the size and the scale of the university system. I don't think you can really appreciate that until you get out and have a chance to travel to the institutions and meet the faculty, and meet the students, and meet the clinicians and meet the researchers – and that's when you really begin to understand the importance of the University of Texas System. So I came in with an expectation and I would tell you it's far exceeded my expectations in terms of what I hoped that it would be. The ability to make kind of a couple of decisions at the top and watch how they're implemented through the presidents and faculty and how they help the great students and the patients – I've enjoyed every minute of it. TT: Are there things that you wanted to do but didn't get to do as chancellor? And, for those things, was the problem you or the system in which you were working – meaning the political system, not the UT System. McRaven: There wasn’t anything on my big list of things that I think I had trouble accomplishing. I had hoped to be able to teach; I was lured here with the idea that I might be able to teach. Little did I know that it would be a seven-day-a-week job and that I wouldn't have time to do that. And so that's one of the reasons why I am hoping to teach or intend to teach at the LBJ School in the spring. But coming back to the bigger question. No, we laid out the Quantum Leaps, as you know, initially eight and then nine, and then kind of back to eight Quantum Leaps. I think we tackled most of those problems and were anywhere from very successful to successful to, in the one case of the Houston project, unsuccessful. But to take a look at the good things we did in terms of student success: We've got great initiatives going at all of our campuses. We're beginning to see the needle move in terms of 4-year and 6-year graduation rates. We are putting money into projects that work at some of the institutions in terms of everything from advising, to making sure that the individual students have the financial resources they need, to having the sense of belonging. We have changed how we attack the diversity issue, or confront the diversity issue, through the Rooney Rule, or the opportunity rule. We're looking at gender pay issues and we're trying to close the gender pay gap. We've had great collaboration with all the institutions, but you take a look at MD Anderson in particular we now have MD Anderson branches at UT Health Science Center in San Antonio, Tyler and Galveston. These are pretty big initiatives and the credit goes really to the presidents and the folks that work the issues here and the UT System staff. But, we laid out the Quantum Leaps and, I think with a couple of exceptions, we have moved pretty strongly in the right direction. TT: I completely hear you. But just to get to the second part of the question. You mentioned that there were a couple things – and I think you're just alluding to the Houston land purchase, which we can go into later – but broadly speaking, what do you think went wrong there? Was it the political system? Was it the environment? Was it just an oversight on your part? McRaven: I think it was just that I wasn't able to bring all the stakeholders together. So when you have a big project like that, you have to be able to bring in the politicians, you have to be able to bring in the City of Houston, you have to be able to bring in the institutions and I've said this before, I mean this was my responsibility to do that and I wasn't able to get all the stakeholders together. I think at the end of the day, the product that the Houston task force delivered in terms of building this idea of a Texas institute for data-science was absolutely the right idea. And I think that a lot of the institutions in Houston – Rice is looking at this now, U of H is looking at a data institute, I mean everybody realizes the importance of data now. But again, I accept responsibility for not being able to make the Houston project work and it was just something that didn't unfold the way I'd hoped, that's all. TT: Do you think your tenure would have gone differently had you not pursued that one project? McRaven: I hope my tenure went well. I think this would be for other people to judge, but I hope what you'll find is people will say we were on the positive side of the ledger. The Houston project didn't go as I had hoped. But I don't think – I mean, again, it was a bump in the road, we got over it and we pressed on with other issues – that happens any time you're running large institutions, whether that's U.S. Special Operations Command or the University of Texas System, you're always going to have things that don't work out quite right. TT: When you were hired, people touted your leadership skills and it seemed like you had a ton of support to make big changes, to pursue the "quantum leaps" that you just described. It sounds like you didn't, but I'm just wondering: Do you feel like at some point during your tenure, like the ground started to shift from under you, that the political climate changed, or legislators' attitudes towards the system's ambitions did? TT: But there are other good things. Right. McRaven: – I'll take the, all the other eight Quantum Leaps that we tackled and put most of those on the positive side. Again, I think this is just a natural part of leadership. I think people outside who have not run large organizations sometimes don't understand the complexity of doing that and so when they see things that go awry, they go, "Oh my gosh, obviously the plan didn't unfold the way you expected." And we have a saying in the military that no plan survives first contact. TT: Regents are currently hiring your permanent successor and a range of names have been floated, from [former Secretary of State Rex] Tillerson, to [former Secretary of Education Margaret] Spellings to [Deputy Chancellor David] Daniel. And, as someone who's been in the position, I'm wondering if you think the skills that come from, say, being a business executive, or from being in politics, or from being in academia, are the most necessary to do a good job as chancellor – or if it's something else entirely? McRaven: I came from the military and people said I had no experience in higher ed, no experience in clinical care. But in my time in the military, I wasn't a helicopter pilot, but I had helicopter pilots work for me; I wasn't a surgeon, but I had surgeons that worked for me. Here, you rely on the great staff, you rely on the presidents, the men and women that we hire to do the work, and as a leader, you have to understand how to empower them, how to put them in a position to be successful; how to lead them and how to manage them, so anybody that comes with those skills – whether it's from academia, whether it's from business, whether it's from the military, whether it's from anywhere else – as long as they are capable of leading people then they'll be great in this job. TT: Do you think the Legislature and the Capitol here understand the value of higher education and fully appreciate the difficulties of the role you currently occupy? McRaven: Absolutely. And, again, it may surprise people but all of the members that I've worked with in my two sessions absolutely understand the importance of higher education. But there are always competing interests, so our job in higher ed is to make sure that we make a case for why what we are trying to do is important for the state of Texas. But you know as we go through this, everybody understands that there are competing interests and there is pre-K through 12, which I have said all along: If you have one dollar, put it towards pre-K through 12. That is important to be able to teach our young men and women and teach them well and educate them well so they're ready to go into the workforce or they're ready to come to a great university. So there are always competing interests. Do I think the governor and the lieutenant governor and the speaker and the members understand higher ed and appreciate higher ed? Absolutely. TT: When you announced your intention to step down, you said health concerns had prompted you to reflect on the years ahead and that you believed it was time to segue to other passions, and you mentioned how much you wanted to teach. Just to be clear: Is there anything else about your time in this job that's contributing to your departure? McRaven: [joking] So you're looking for the bad story, are you? TT: No, I'm not. I'm just trying to cover my bases. McRaven: There really isn't anything. I've really enjoyed my time here. People don't quite appreciate it but any time you're in a big position and a big job, it's challenging, things don't always go well. But the fact of the matter is, the main reason I'm stepping down is I had health problems last year. I've been at this now three and a half years. I've enjoyed it – I've enjoyed the challenges, I've enjoyed confronting those challenges in terms of student success and other things. So no there is nothing else contributing to my departure. TT: I know you've been asked about this many times but, again, I have to ask: Would you rule out a future in public service? What do you see as your political future, if any? McRaven: I have no political future. I'm not interested in politics. McRaven: I'm interested in policy. So I have not ruled out working in the policy world in the future. But I have no interest in politics. I have been married 40 years as of this month. And I would like to stay married 41 years and if I went into politics that might not happen. So again: Policy yes, politics no. TT: Well, just in my short time here, the one thing that people keep mentioning to me is that they thought you were a [candidate] for the Secretary of Defense position had Hillary Clinton won. And, I guess, would you want that post? Would you be interested in it? McRaven: – which posts and when. Like I said, I'd be honored to serve in the government again if the position was right and if I thought it matched my skill set. TT: This is kind of a strange question but I'm just curious about it since you're on your way out of being in the position of chancellor. What keeps you up at night these days? What are you worried about? McRaven: Pre-K through 12. I'm often asked when I am sitting in various forums, and we start to turn to national defense and national security issues and somebody in the audience will invariably ask me what I think the biggest national security issue is, and my answer's the same every time: It's pre-K through 12. Which surprises them, they think I'm going to say North Korea or they think I'm going to say Iran. But the fact of the matter is, my biggest concern is: Are we educating the youth of America well enough so that in 10 years, 20 years that these young men and women will be great citizens of the United States, that they will be ready to come to college? That they will be ready to serve in industry and in technology? And I don't know that I think we have found the right answer to that yet. So the thing that keeps me up at night is making sure that the state of Texas – or hoping that the state of Texas – and the nation is investing in our pre-K through 12 in a way that will put our young men and women in a position to be successful. Disclosure: The University of Texas System, the MD Anderson Cancer Center, the University of Texas Health Science Center at San Antonio and the University of Houston has been a financial supporter of The Texas Tribune, a nonprofit, nonpartisan news organization that is funded in part by donations from members, foundations and corporate sponsors. Financial supporters play no role in the Tribune's journalism. Find a complete list of them here.